Happy Monday! I hope you all had a great weekend. Mine was pretty busy, but also snowy. 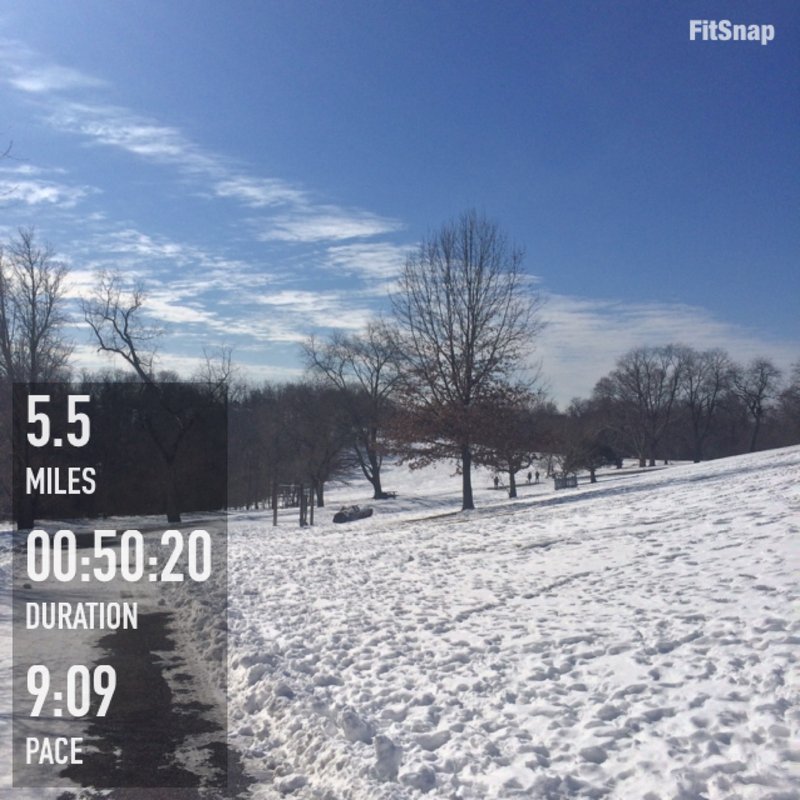 Saturday's run - lots of hills and snow! Pittsburgh got hit with a bunch of snow on Saturday night, so I didn't get out at all on Sunday. Luckily, there's a lot to do within walking distance of my apartment, so Dan and I went out for brunch, went bowling, took Selma on a walk, and did some yoga at home! This month, I start training for my next half marathon (Biggest Loser Half in Erie). I use Hal Higdon's Intermediate plan as a base of my plan, and adjust it to fit best with my schedule. A major challenge I'll face this month is the musical that I'm in. We have dress rehearsals March 9-11, then the show runs from the 12th through the 15th. Hopefully I'll be able to keep up my workouts! My first race of the year will be the PHenomenal Hope 5k on April 4. P.S. I added a Races Page to the blog! I listed out all the races I've signed up for so far, along with an A, B and C goal for each. Now, let's get into what my week looks like! -C25K run with Dan. We just registered for the Achilles Pittsburgh 5k on April 11, so it's time to kick it in to high gear! Thanks for stopping by my blog, Gretchen! Your upcoming race schedule looks fun! I love that you listed your A,B & C goals as well. I used to always go into races with one time goal in mind, and wouldn't be happy unless I got exactly that (what do you know, that pretty much never happened!). Happy training! I need to get to Pittsburgh to do a race or two! I have my eye on the steelers one in September. Good luck with your training! I've heard really good things about the Biggest Loser race series. Have you done it before? I haven't, but I'm a huge fan of biggest loser. I actually heard about the race from the SCRR Facebook group..I guess this is the only half marathon being run around presque isle now. I'm excited to try it out! 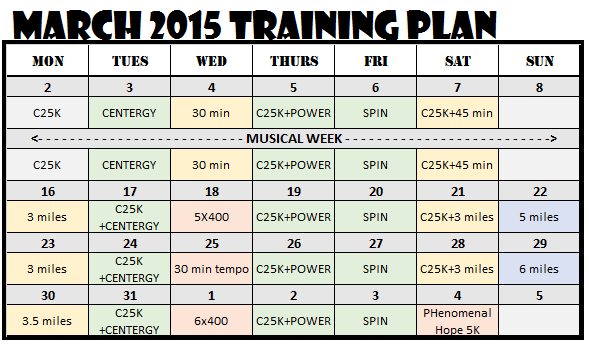 Looks like a solid month of training! Has the Biggest Loser race replaced the Presque Isle Half Marathon? I've always wanted to do that one, but Erie in the summer (so much humidity!!) keeps making me reconsider. I just did a little bit of research and it looks like the running club in Erie added a new half marathon since they changed the original race to only a full - https://www.google.com/url?sa=t&rct=j&q=&esrc=s&source=web&cd=1&cad=rja&uact=8&ved=0CB4QFjAA&url=http%3A%2F%2Ferierunners.club%2FRaceInfo%2Fupcoming_events_view_detail.php%3FeventID%3D31&ei=1df1VOmZMOTLsATGnYGABw&usg=AFQjCNGD__0D_lUkVymWjNqSOF6KVLMZ2Q&sig2=iYRgAZxBFzb_i9bRDm4mJw . I don't think the BL half is related, because they've held in in past years. I could be totally wrong on all of this though!